Mike returns to his ancestry along the bloodlines of his father and his fathers’ father. The result is a collection of original songs, some with traditional feel and some contemporary but all with the ring of truth which is the Irish way. Produced by Mike Brady along with the brilliant guitarist Steve Cooney and Mike’s brother Doug, the tracks feature some of Ireland’s finest musicians including Steve Cooney, Martin Hayes, Christian Brady, Odhrán Ó Casaide, Robbie Perry, Dermot Byrne, Donnchadh Gough, Liam Ó Maonlaí, Laoise Kelly and Tony McManus. There is also a guest appearance by William Barton on didgeridoo. This album will stir any person with the slightest drop of Celtic blood in their veins. It is uplifting, it is sad and it’s very reflective. In the past few years, I’ve written ballads inspired by tales I’ve come across as a resident of the rugged south west coast of Victoria. Legends of shipwrecks, sailors, loggers, emigrants, fishermen and yarn spinners, some with a strong Irish flavour because so many Irishmen chose to call Australia home. I knew that I had the essence of a full album but I still couldn’t decide on the musical treatment that would best bring the stories to life. Not long after I took a trip to Ireland to visit my son, Christian, now living in Erin and a fine woodwind player and guitarist. I also wanted the opportunity to be able to re-connect with the land of my father. Christian and I played some ‘sessions’ together in friendly pubs around the county and we were, of course, literally surrounded in Irish music. And it was then that the penny dropped! The sheer emotion of Irish music was the way to go with BLOODLINES. I wrote more songs and we recorded the album in Ireland, some tracks in the muso’s homes with Steve coming on board as my co-producer. 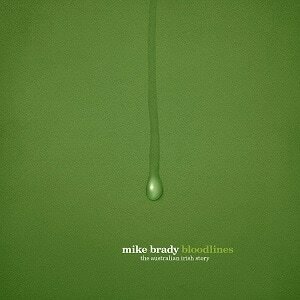 The Brady bloodline is pure on each and every track too. My brother Doug was the recording engineer and all the woodwind instruments, including flute and whistles, are courtesy of my son, Christian. All other musicians on the album are Irish, with the exception of the didgeridoo of William Barton. Some are famous, all are very good … Their talent is as boundless as is my gratitude.